Price: It is price at 349 rupees for small pump of 20 grams and the bigger pump of 50 grams costs rupees 749. 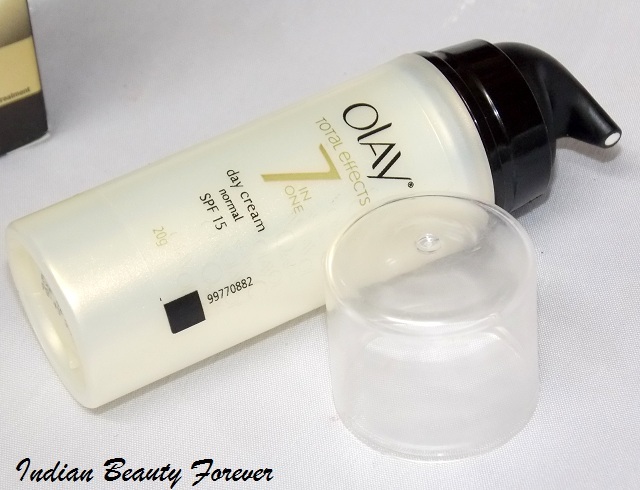 Experience: Olay total effects day cream comes in a small pump bottle that stands around 3 inches tall and the product it contains is only 20 grams as the cylinder inside the pump is really small just to accommodate 20 g of the cream. 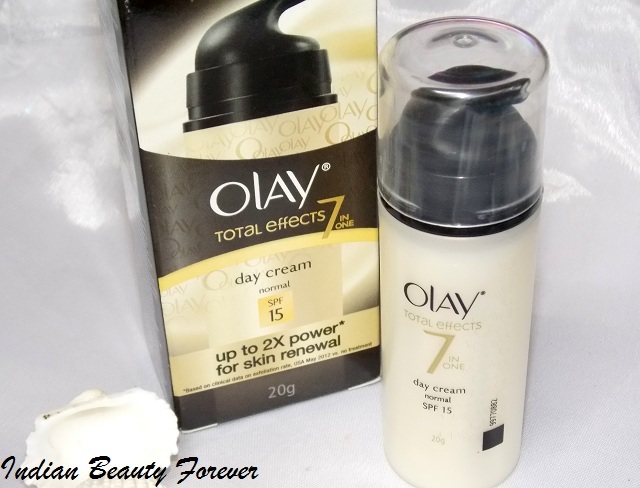 Olay's 7 in 1Total effects range actually has a couple of different creams like this day cream and its night cream, They also have Total effects anti aging cream plus serum and the same has also been formulated as with a touch of foundation that can be used during the day time to give your skin some coverage. 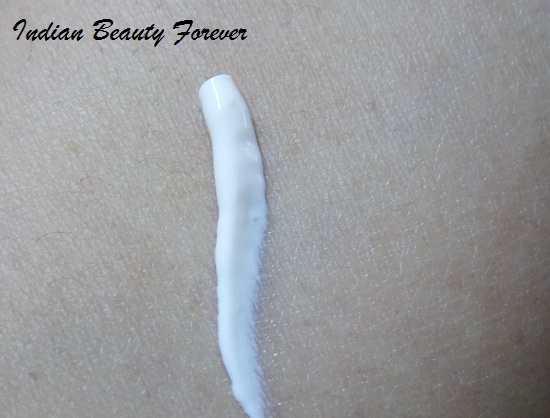 This day cream has very mild fragrance and the consistency is not too thick. Once applied on my skin it get absorbed very easily and there is no greasiness at all just when it is freshly applied. It gives hydration but not much since it isn't very greasy as I said. 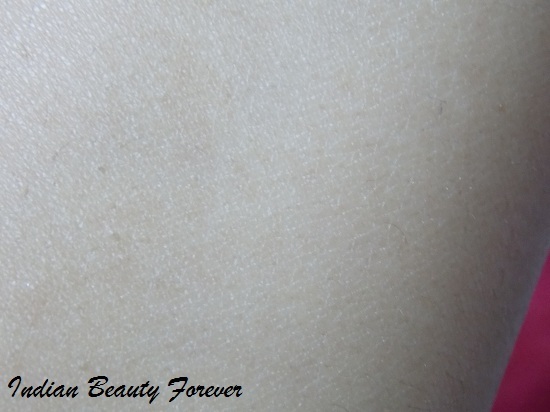 I have combination skin and even on my T zone I do not feel, it is leaving a sticky, shiny, greasy residue. but on the same note, It will not be very moisturizing or hydrating for dry skin. If you have dry skin and you want to use this anti aging cream during the day then, you may try your moisturizer or some other cream before or after this. My skin looks toned and glowy but greasy for around 2 hours and then my T zone starts to look shiny and when touched with the back of my hand, I noticed, it has become oily, though cheeks are still the same. So, during the entire day, I had to use tissues or sheets to absorb the oil on the T zone. I think this should be fine as in even if I dont use anything the T zone secretes sebum at the same rate, so I won't say that this cream has resulted the oiliness. It has SPF 15, therefore most of the time, when I go out in the sun, I skip wearing sunscreen or will use my lotus gel sunscreen. I have noticed that when I use my gel sunscreen my skin gets less oily. 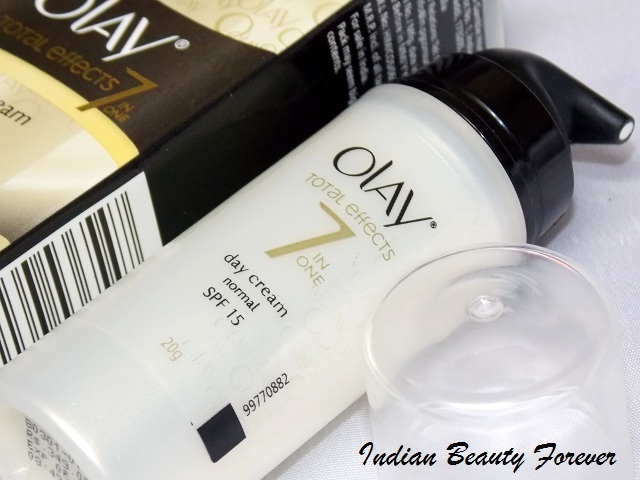 I take a little bit of quantity of this olay day cream as it can spread very well on the skin, so more than a half pea size is enough for me. It has lasted me for around 3 weeks and after using it for that time, this is what I have noticed, if I go by as per the claims that they have made. Fine lines and wrinkles- Its better to use it as a preventive measure or may be with continuous use, it can erase out fine lines, if not the wrinkles. Uneven skin tone - I have slight pigmentation on my jaw and I have not seen anything significant there. Dryness- This doesn't applies to me, but I think It will not be enough to combat dryness since my skin is combination and it still not feel greasy on me. Pores- Not really may be the smaller ones. 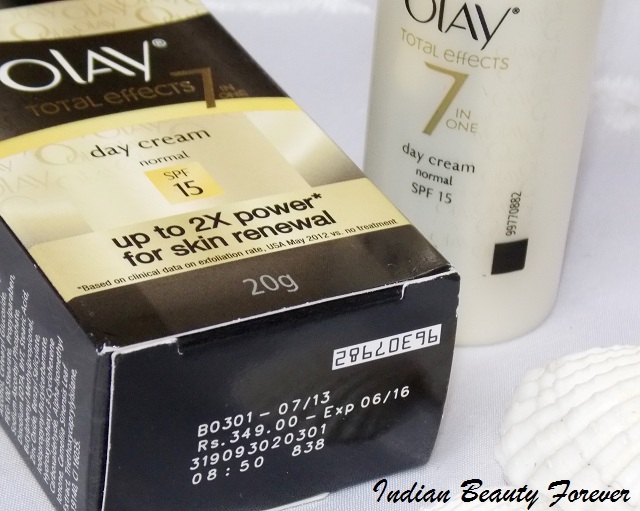 I will say that Olay total effects day cream can be a good option if you are in your mid twenties and would like to start an anti aging skin care. Not only this this can also be used even if you are in mid thirties or are fighting wrinkles and want something that should be affordable. 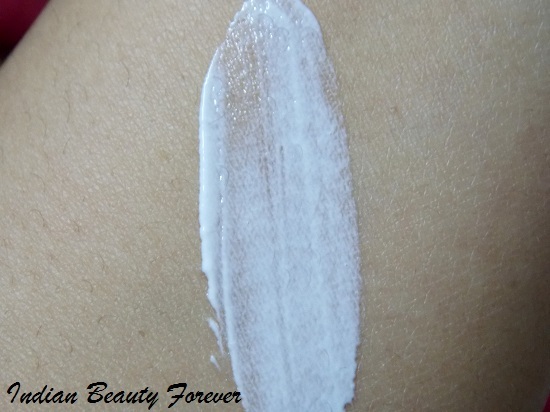 This may not be very hydrating for dry skin but for normal to oily skin it will fare well. I would have gotten a second bottle for me as I really liked this cream due to its formula and the way it has fared or rather as a preventive measure for me but even before it finished, I got Lancome Paris's new launch Dreamtone which is for my specific pigmentation profile, If you follow the blog regularly, I posted about Lancome's event a week ago. This small pump lasted me 3 weeks so that way it is economical for me else you may also look for Garnier wrinkle lift that is also a good choice and half the price. 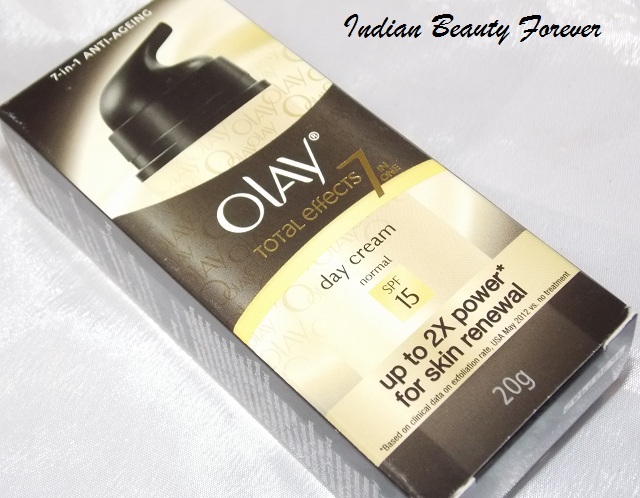 Take- Olay total effects day Cream has SPF 15 has made my skin look even toned and bright. Its non greasy texture will suit normal to combination skin though dry skin may need something more greasy over or before this. 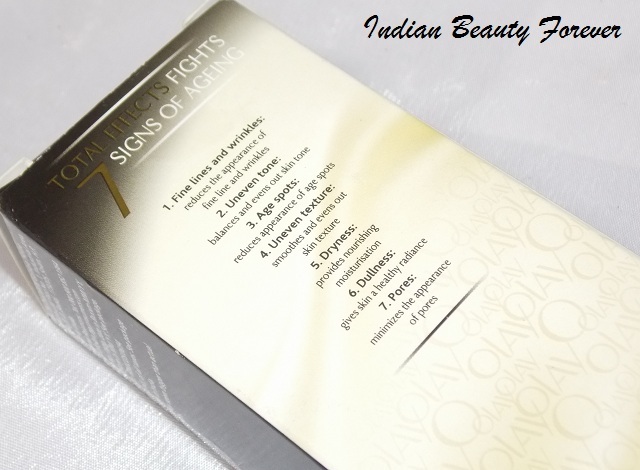 It is a good option if you are thinking of starting a good anti aging skin care. If asked yes, I will repurchase this.